You might not have fully digested your first helping of Bowman Platinum, but the next helping is already here. Topps released preview images and basic product information for 2011 Bowman Platinum on Thursday, a product that will arrive in late-June — just months after the product made its baseball debut. There will be two prospect autographs as well as one autographed Relic in every 20-pack hobby box. Each 12-box case will include one multi-autograph card and redemptions for on-card autographs from the latest crop of USA Baseball players. 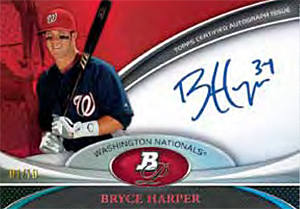 The product will mark a high-end (Chrome) arrival of Bryce Harper autographs as the 18-year-old No. 1 overall pick is slated to have a Chrome Refractor Prospect autograph in the product as well as appear on the triple-autograph card (top) also signed by Stephen Strasburg and Ryan Zimmerman. 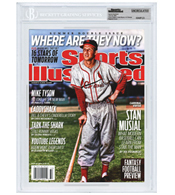 Today’s the day that many had marked on their calendars — well, after Topps pushed up the release date — as it marked the arrival of the annual baseball card-collecting staple. You know, the annual Topps Baseball set. While our Box Busters review boxes are somewhere in an iced-over UPS truck likely stuck in a snow drift and the Beckett Media offices are closed for a second consecutive day, a little lot of snow ice wasn’t going to stop your idiot intrepid editor from journeying through the tundra to a Target store. After a blaster box, jumbo pack and way-too-many loose packs to mention, here’s a selection of cards from this year’s set … after the jump. 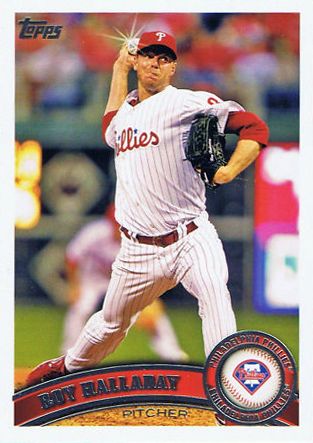 Also be sure to take our poll — on whether you think 2011 Topps is a winner or a loser. The first boxes of 2011 Topps Baseball have been ripped and the first reports of oddball findings are coming in, too. The most notable previously unannounced finds are cards that have the twinkle or sparkle of a diamond digitally placed into the photograph of the card. The Queen will now include some royalty. Topps unveiled its plans for a new baseball card set styled in the fashion of an 1887 release some time ago, but on Friday the longest-running manufacturer of baseball cards announced a little something extra in packs of the forthcoming 2011 Gypsy Queen baseball cards. Prince William and Kate Middleton — two members of Britain’s Royal Family — will appear on a card. Building on the product’s “jewels” theme — which includes bonus cards of various gypsys (yeah, we’re mystified, too) — a “Royal Jewels” card can also be found in packs. No word on a card of Enrico Palazzo, though. Join Beckett Baseball‘s Chris Olds as he opens a pretty special box from Topps that contains something that just might be yours soon. A heavily scrutinized Topps baseball card featuring the autographs of nine members of the 1927 New York Yankees has been judged to be authentic, according to more than one authentication company, and will return to the auction block on Thursday. 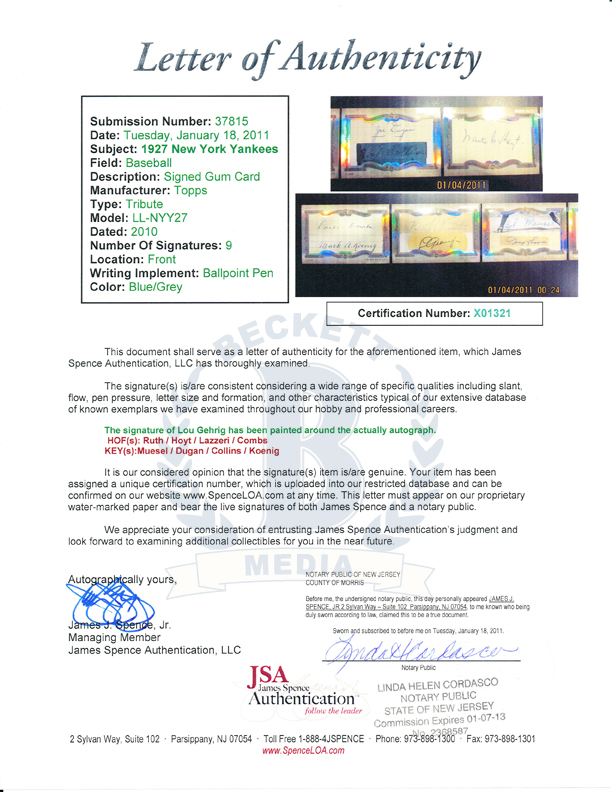 However, the card’s examination wasn’t without a new caveat not previously mentioned publicly as the autograph of Lou Gehrig appears to have been painted around to obscure lesser signatures near it — making it more visually appealing — according to James Spence Jr. of James Spence Authentication. How rare is this kind of alteration? This aspect is noted on the Spence Letter of Authenticity, which will be included with the card when it is sold by Beckett Select Auctions , the consignment auction service division of Beckett Media. The auction will launch Thursday with an opening bid of $20,000. The auction will close on on Super Bowl Sunday following the game here in Dallas. The 2010 Topps Tribute Legendary Lineup Cuts card features the signatures of Earle Combs, Mark Koenig, Babe Ruth, Gehrig, Bob Meusel, Tony Lazzeri, Joe Dugan, Pat Collins and Waite Hoyt — all on one booklet. A redemption for the card was found by a collector in Missouri, who opted to sell the card through Beckett Select. The auction briefly ran in December with a starting bid of $20,000. However, Select ended the auction early as a precaution when it received multiple questions about the authenticity of the Ruth and Gehrig signatures. Join the Beckett Baseball crew of Brian Fleischer and Chris Olds as they rip into a pair of 2010 Bowman Sterling baseball cards from Topps in this latest edition of Box Busters.